I'm stay at home mum who knits. I knit this for my Whovian 10 year old son, who loves it. It was really tight around his head before blocking, but thankfully, blocking did the trick. The yarn is just lovely, silky 100% merino with just a perfect barely there amount of drape. I knit the medium size, and I followed the pattern, though I did use the It’s not About the Hat pattern‘s colour-work technique. The standard Fair Isle technique of carrying yarn behind the work has never worked out for me, my tension is too uneven, and not even blocking can save the FO. I really love this new-to-me colour-work technique; it’s actually very simple, though there are very detailed instructions in the It’s not About the Hat pattern. I may even use it to substitute intarsia one day. Next time I knit this hat, I would do about twice as many rounds of ribbing at the beginning, as there is barely enough ear coverage for truly cold days (say, -25C and below). I made these to match the Dalek hat above (actually, I made the mittens first then the hat). I inverted the colours to make sure that I would have enough to make the entire hat/mittens set. As you can see in the photo, these mittens are getting a lot of use, especially being snow-covered, jammed into coat pockets while soaking wet, a lot of friction while damp, etc.. etc… And they are holding up really well. I am very impressed. Tosh DK is not the princess-y kind of expensive yarn I was worried it might be. They also dry very fast; my son hasn’t had to deal with trying to keep warm by pulling on wet, soggy, somehow-even-colder-than-outside slush blocks (aka ‘mittens’). I didn’t quite follow the pattern. I changed the patterning on the palm – the yellow just completely overpowered the blue, it was very unbalanced (with my colour selections). So I just did the simplest pattern I could think of – y,b to end, next round b,y to end, repeat these 2 rounds. The thumbs are knit in the background colour, then the contrast colour is duplicate stitched in. I didn’t quite finish the duplicate stitch chart; I did just enough so that pattern flowed from the hand. Duplicate stitch is just not my thing, but it’s a good idea for the thumbs, obviously. All in all, I loved knitting the hat and mittens, and I am so happy my son loves them too! I finished a WIP from last week, the Insulate! mittens, so as one does, I immediately cast on for two more projects. The Insulate! hat is actually done, I finished it last night. The photo was taken yesterday afternoon; immediately after taking its picture, I decided that I had to work on this hat. I pushed everything else aside, including this post, which should have been written and posted yesterday. It’s super cute, though a little small (did I check gauge? no, of course not) but I haven’t blocked it yet, so fingers crossed it will get larger. I cast on a Hitchhiker as well, I’m using Hedgehog Fibres Twist Sock, which is 80% BFL wool and 20% nylon. I love the yarn, and the colours are amazing. I find knitted speckled yarn gives a lovely gentle overall effect, but can still use many wild colours, while variegated can be hit or miss when it knits up. 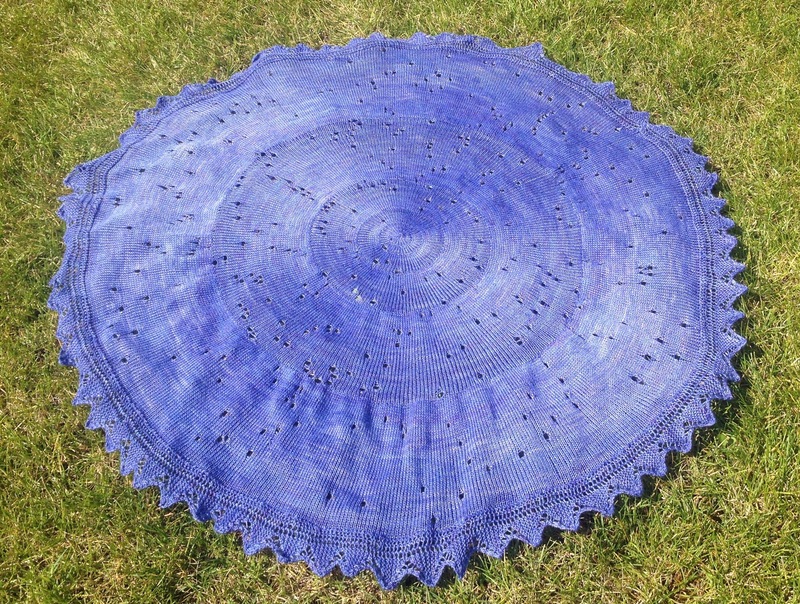 This shawl’s construction is fun to knit, since it goes so fast at the beginning. 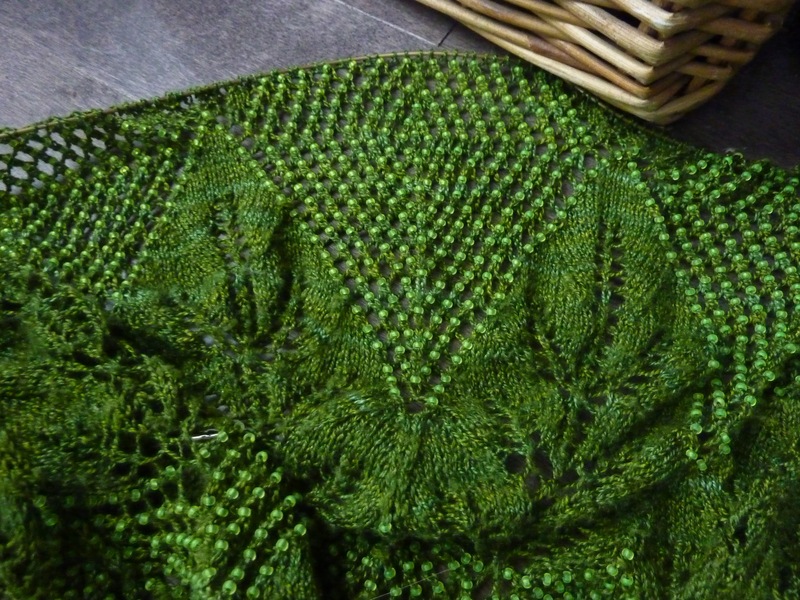 I am so close to being done with Chart Three on my Evenstar. Only 1.5 rows of patterning, and 5 rows of plain knitting, left. I can’t wait to start the bind off/Chart Four. I haven’t worked on any of my other WIPs this week, though the socks are bugging me. My daughter hates the toe seams in commercial socks; the guilt of not being a consistent sock knitter (e.g. my Monkey Socks took me just over three years to complete) is really getting to me. And yes, I did put an overturned box on my back porch to use a table / snow protector to take these photos. On a sunny day, the snow outside (it is everywhere) works almost like a light-box. The colours are accurate for once. Oh! and that overturned box was used to ship an Ashford bottom whorl spindle to me. I plan to learn how to spin, but for now I just want to get my feet wet; I want to master the spindle and enjoy it before jumping into the spinning pool. I recently cast on these mittens, they are a blast to knit. I’m trying traditional colourwork for the right hand (which is finished), and a new colourwork technique for the left (in progress). So far loving the new technique, but I have to wait for the left mitten to be done before I know the final result. Yes, I am knitting mittens with Daleks on them. Pattern here. This also my first time knitting with tosh dk, so love it, but I have to wait and see how it wears in real life. The blue is spectrum and the yellow is maple leaf. I’ve also made a little progress on this old friend from 2014, my Evenstar. I should finish the 3rd chart very soon. I will be using beads for the 4th and final chart. This shawl and In Dreams are part of my detention o.w.l. for hpkchc, so hopefully they will both be done by April. Seriously, there is no reason (other than time) that I’m not working on them / that they aren’t finished already. 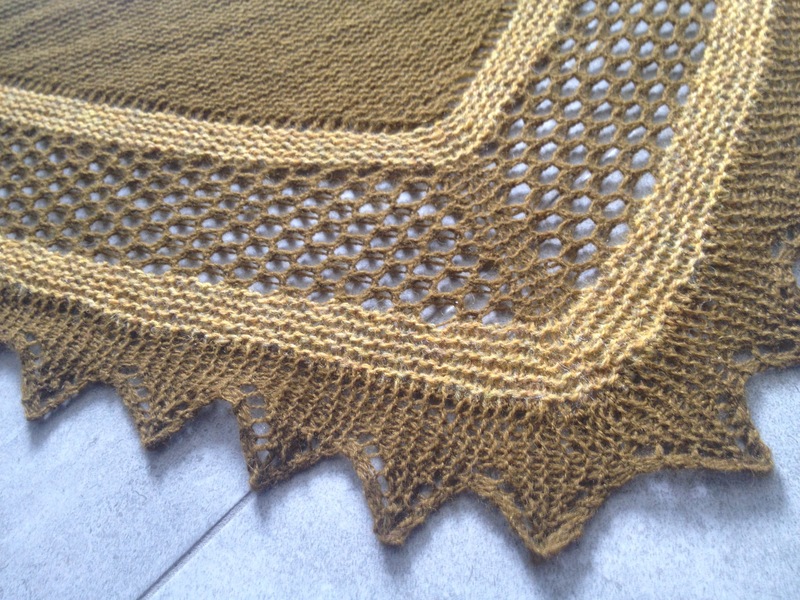 I had a few skeins of Old Gold in my stash and I wanted to knit it up because it’s really not a ‘me’ colour. (Yup, I’m the kind of person who eats the cake before the icing, most of the time). 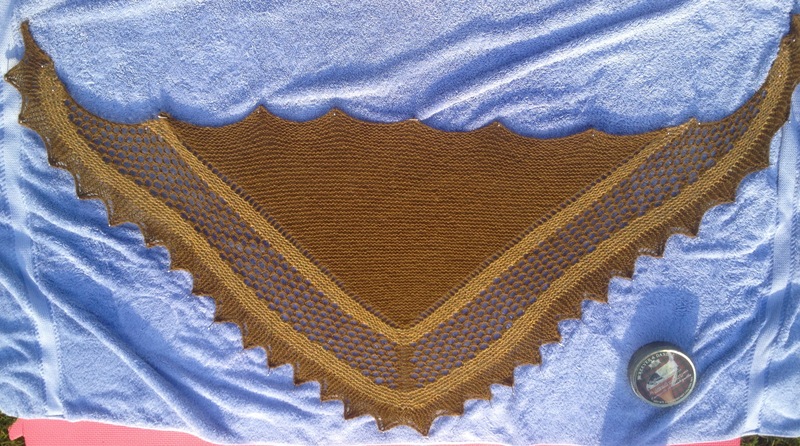 The yellow ochre is a much happier colour, but I only had one skein so I decided to use them together on this shawl to make the Old Gold less painful. Yes, colour can affect my emotions. It may be crazy but it’s true for me. The honeycomb pattern is ridiculously simple, so simple that I underestimated the amount of attention I needed to use to not screw it up. I was tinking back regularly, but I always caught my mistake before starting the next row. I do love the honeycomb stitch pattern. Still a little tight at the top ends, but better than before. 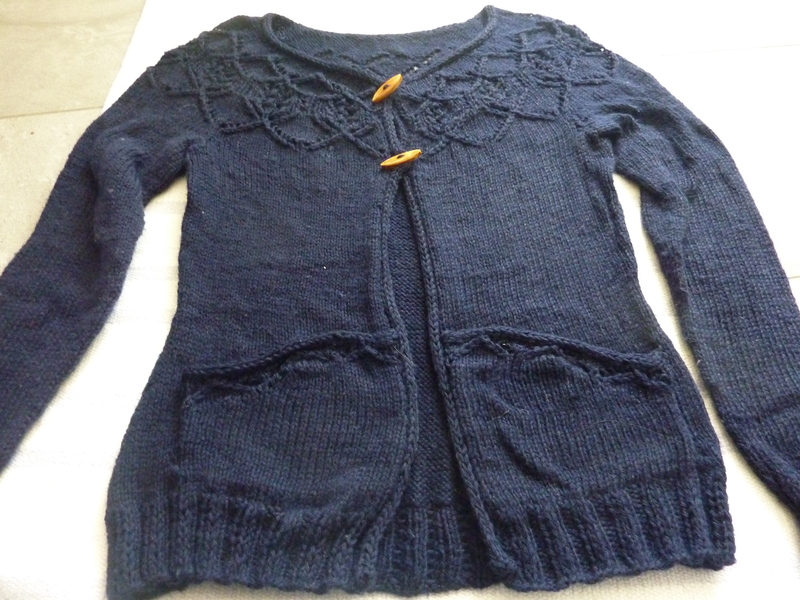 Ideally, I’ll make this one again soon in a colour I can truly appreciate, especially to see if I still get tightening of the honeycomb pattern at the top ends if I use just one skein to knit it. This was actually a simple knit, despite the fact of not having a memorizable pattern until the cast-off edging. It only took me about 5 points or so to memorise the cast-off edging, so that helped, but the edging took seemingly forever. I was knitting 2 rows (8 to 20 or sts each) for every 1 stitch cast off. Beautiful, elegant result though. I was also casting off in the same way at the same time for my Aestlight shawl (completed) and my full Hansel (almost!). 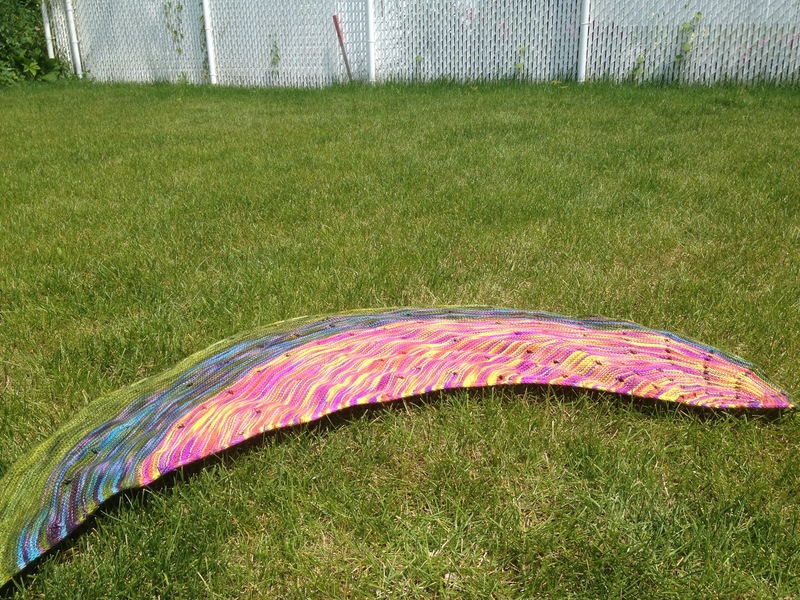 The Seduction yarn is very, very slick, smooth and shiny. I loved it. It’s also resistant to pilling; I tend to knit on the go, and I often don’t have the time to be princess-y with my projects. That is, sometimes I just shove everything into my purse as I’m running out the door. No project bag or even a plastic grocery bag to protect my work from the chaos of crap that can be found in my bag. For example, I have a metal seashell and small stuffed giraffe in my bag. No particular reason, they just ended up in my bag and decided to move in. So I’ve dealt with pilling before, and if a project doesn’t pill on me, that yarn is extremely resistant to pilling. This is also the first project using beads that I have completed. My first beaded project is In Dreams, which is still on the needles. I wasn’t daunted by the beads themselves, but it is difficult to work with so many beads with a 4 year-old running around. The 4 year-old in question is now almost 5 and about to begin kindergarten so I’m really hoping to pick it up this fall. 1. Cast-off/edging for my full Hansel – I have less than 10 points left to do. 2. 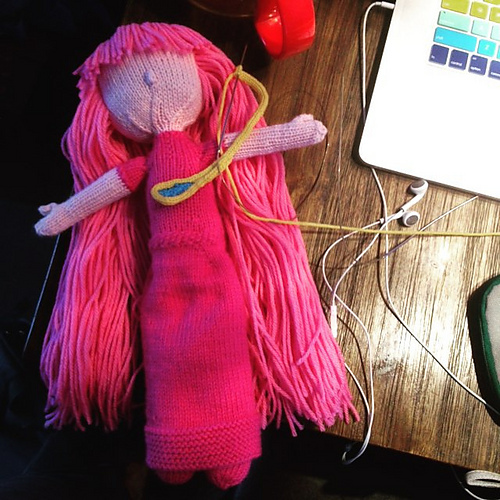 Princess Bubblegum (I am using Astrid the Viking pattern) I have only the crown left to do, but it is i-cord so I am avoiding this, of course. 3. Luke Skywalker. I started him last week, while avoiding PB’s hair (so much hair), I’m only a few rounds in. Yet again, I am using the Astrid Viking pattern as a base. 1. Evenstar. It’s been well over a year since I started chart one. I haven’t worked on it meaningfully since last fall. 2. In Dreams. So many beads. I haven’t picked it up since last fall either. 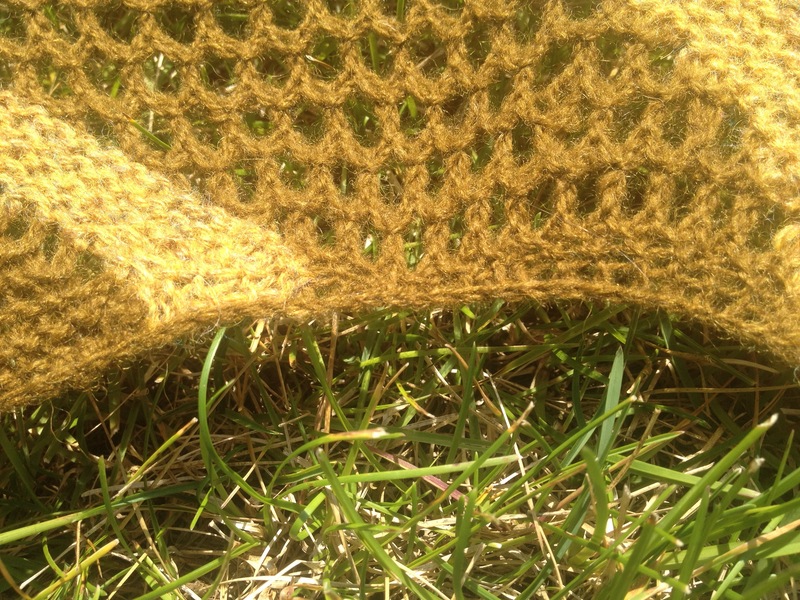 This was a really fun knit, the simple garter stitch made it a really relaxing and enjoyable knit. The cheerful colours helped, too. I had to rip it out and start over after the first 2 wedges. I was just following the instructions, but I couldn’t ‘see’ where the instructions were taking me; usually when I read instructions I can see the results in my head, but not this time. The first two wedges were a little goofy so I frogged it and started over. This was my first time making an i-cord edged shawl, a little confusing a first but a beautiful, modern, and simple result. 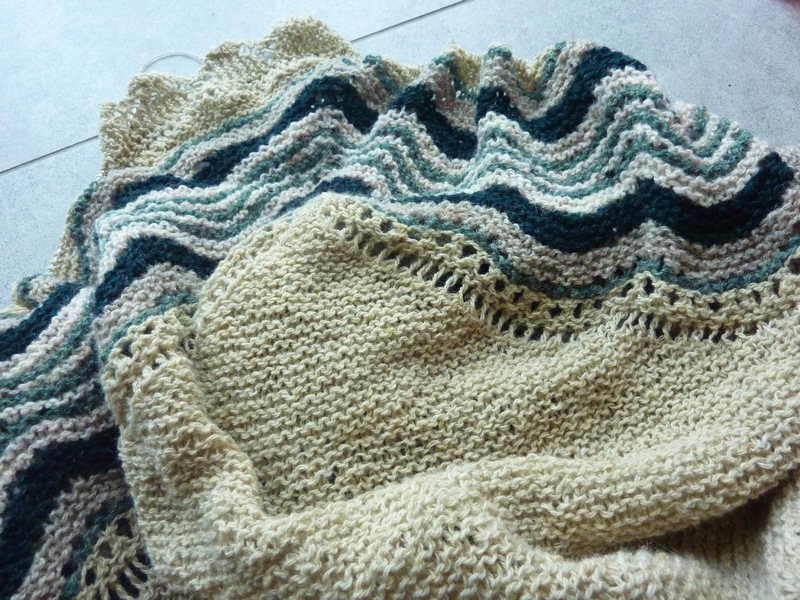 In the past three months, I’ve made 4 shawls and three of them had knitted-on edgings. I’ve finished two of those edgings (Celestarium and Aestlight) but I’m still plodding through my third (Hansel). 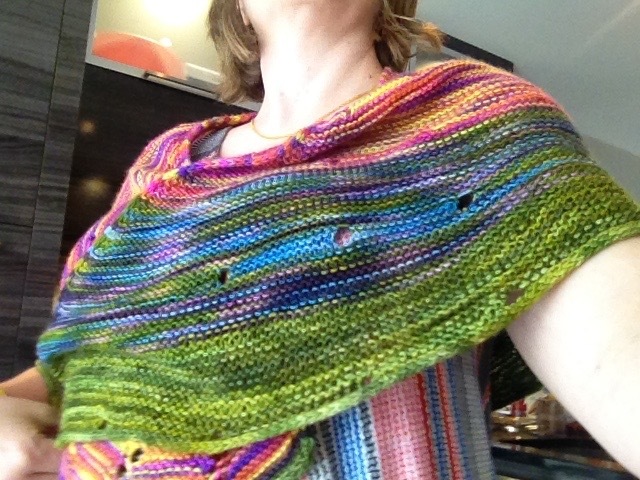 One thing I noticed when knitting this shawl is yarn twist and what a difference it makes. All the yarns I used are sock yarns, the pinky/purple/yellow and the bluesy/purple yarns are BMFA, but the green that I knit the last wedge out of is Fleece Artist. The BMFA yarns have a high twist and the fabric is a lot more firm (but still soft!) than the drapey result I got from the lower twist Fleece Artist. I don’t mind the last wedge being drapey, I find it interesting. I think I would have been really bothered it was in the middle wedges. It almost makes an additional edging to the shawl. The bold colours of my Dotted Rays are really going to get me through winter, I foresee a lot of use out of this comfy shawl. It’s fitting that I finished this hat right after my Shalder cardigan. I put this pattern in my queue at the same time that I put Shalder in my queue; I was fascinated by the carbuncle/diamond motifs used for dwarven objects in The Hobbit movie. 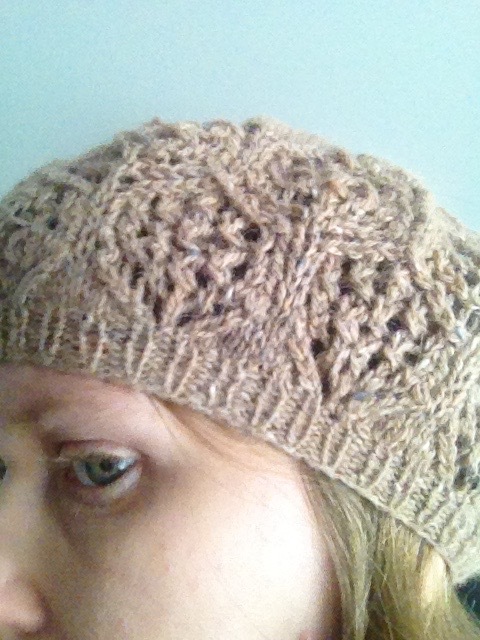 I love how it turned out; I think it will be my main hat this winter even if there is an openwork / lace motif. I originally meant to make the hat and the cardigan as a matching set because of the carbuncle design feature, but they are knit at different tensions and knitting them in the same yarn would be boring. 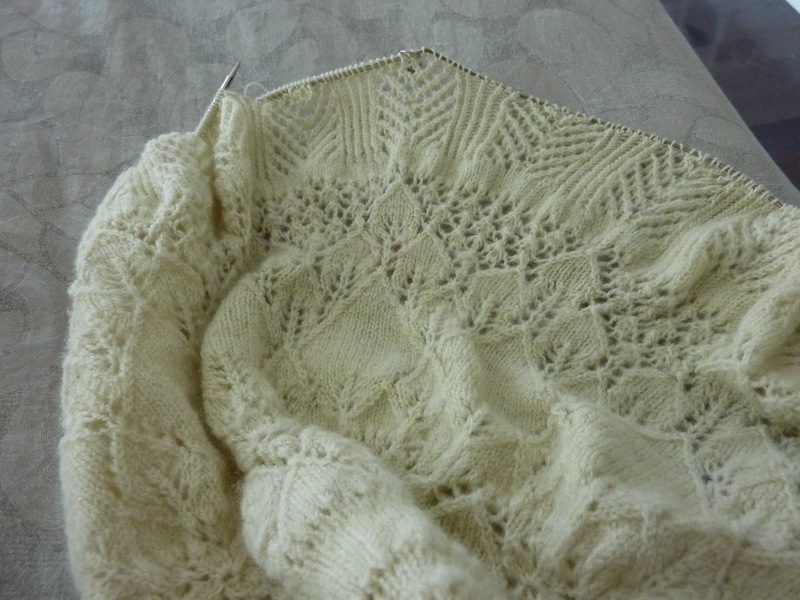 The carbuncle lacework shows up more clearly in lighter coloured yarn, too. Now if I could just finish an idea in less than a year, instead of the nearly three years this one took me to complete. I love this sweater, the fit and especially the lace yoke. I originally chose this pattern way back when the first Hobbit movie was released. I loved all the dwarves’ costumes, and I noticed that there were a lot of geometric shapes. Shalder’s yoke pattern reminded me of that. It was in my queue since then, I only started working seriously on it this year. I think I had done about 7 cm of the body in 2013, I picked it up a little bit last summer but really got down to business this year. There’s a bit of a dye lot issue – one sleeve appears to be made from a different lot, so there is a bit of a colour line at the yoke, but it’s not too bad. I have no idea how it happened. I’ll put it down as some sort of punishment for letting projects linger for no good reason.